This excursion is a Salmon and/or Halibut fishing trip depending on current fishing conditions. 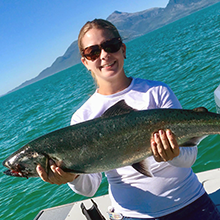 This is the Alaska Fishing trip that we recommend to our clients that are primarily interested in Salmon Fishing. The important difference with this Salmon Fishing trip is that if the Salmon are not running we are going to run to a fishing location that allows us to target Halibut so that we catch fish. Your guide will discuss which species have been producing most in recent weeks before heading out. As a group, you will decide which species to fish for first and you may decide to spend more time fishing for one species over another. Our Alaska Fishing trips take place in our 24 ft. Cabin Cruiser vessels which can accommodate a maximum of 6 passengers and carry an average of four or five.